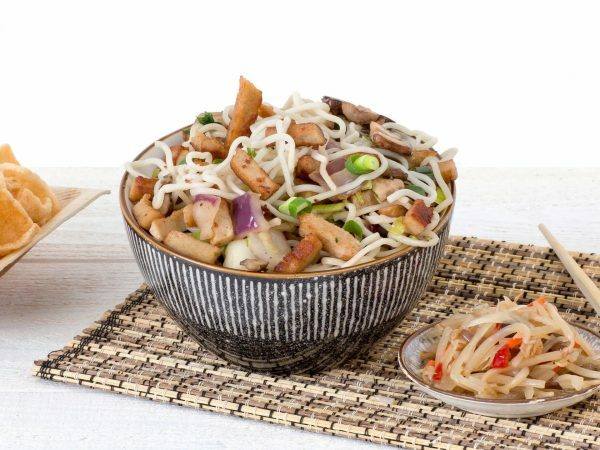 This vegetarian Stir-Fry Strips can be rightly called unique. The pieces have a threaded texture closely resembling chicken meat. Suitable for many applications such as meals, salads or pizza. The stir-fry strips are pre-cooked and ready to incorporate into existing recipes. This product is available in various formats. Water, vegetable proteins 14% (soy, wheat gluten), egg white*, starch (potato, wheat, corn), palm fat, flavouring (egg), milk protein (lactose), sunflower oil, herbs and spices, dextrose, salt, acid (citric acid), mineral (ferrous fumarate), vitamin B12. * Free-range eggs. Produced in a facility that processes peanuts and nuts. Frying pan : 3 min. on moderate heat. Stir every now and then.